Engine ignition timing governs the spark signal to the spark plugs for firing. The distributor, according to its rotational position, can either retard the spark or advance it. Setting the correct timing gives optimum performance-acceleration and efficient fuel economy. If the timing is set incorrectly, the engine can sputter at low or high speeds, idle roughly or cut out when the accelerator pedal is applied suddenly. Timing set too far advanced can also cause engine overheating, even when the cooling system works perfectly. Put the vehicle in "Park" and set the emergency brake. 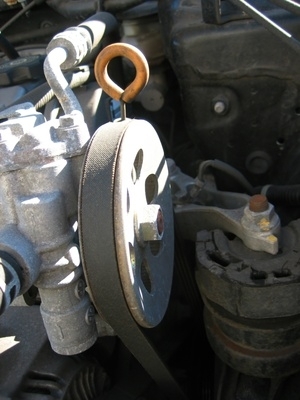 Lift the hood and locate the harmonic balancer (crankshaft pulley) at the bottom front part of the engine. Have an assistant momentarily flick the ignition key (off and on) to rotate the pulley in increments, so that you can clean it thoroughly. A small metal tag with graduated numbers and lines on it needs to be cleaned off, as well. The timing tag sits slightly above the pulley. Use a flashlight or drop light to see the marks clearly. Make a chalk mark on the groove-line on the pulley. Make a chalk mark on the metal tag at the "0" indicator mark. This will allow the marks to show up clearly when the timing light strobe hits them. If you must, use a step stool to give you the height access you will need to reach over the fender. Locate the set-timing connector plug on the firewall or on the main wiring harness. The wire for it will be colored tan, with a black stripe. This will clear the computer codes, so that your adjustment will be a new input into the vehicle's computer. Disconnect the rubber vacuum advance hose from the side case of the distributor (it will protrude from a small diaphragm). Plug the end of the hose with a small bolt. 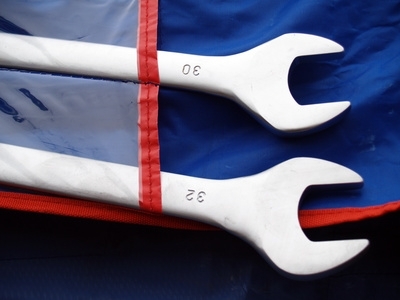 Loosen the distributor mounting bolt with a 1/2-inch distributor wrench. Use a socket with a universal joint, if you have enough room. You want the bolt only partially loose, providing enough friction to the distributor, so that it does not rotate easily. Connect the timing light lead to the number 1 cylinder plug wire. The number 1 plug will be the first plug on the right side, as you are facing the engine. Some timing light leads require hooking them up to the battery--apply black to negative, and red to positive. Set the adjustment on the timing light (with the small dial) according to the specifications listed. Most GMCs have a spec decal glued to the top of the fan shroud, indicating the correct number. If it requires 12 BTDC (before top dead center), dial the timing gun to 12 degrees. Have your assistant start the engine. In the case of using a remote starter, hook up the one lead to the main positive terminal on the starter solenoid and clip the other wire to a ground source. Have the assistant move the distributor slightly left or right while you point the timing light down directly onto the pulley timing marks. Align the two chalk marks and tighten the distributor mounting bolt. The proper timing is now set. Shut off the engine. Reconnect the set-timing connector plug, then reattach the vacuum hose to the distributor. Disconnect the timing light leads and the remote starter (if you have used one). Restart the engine and look for any trouble codes. The new timing adjustment input is now re-calibrated by the computer. 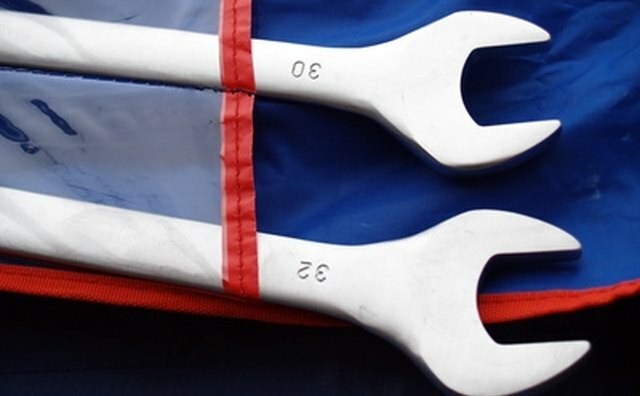 The GM (Chevy) distributor wrench for the 350 engine is designed specifically to reach the distributor mounting bolt. Purchase one for future use. Watch bare body parts (arms and hands) around hot or warm engines, especially when leaning into the engine compartment. Keep the timing light away from spinning fan belts and the radiator fan--damage and injury can result.